One of Airbnb’s most popular features, Airbnb Experiences, is still not widely known to many travelers. In addition to home and room rentals, you can also use the site to search for unique experiences in the cities you’re traveling to or living in.The offerings go well beyond your typical sightseeing tour, and many of the experiences offer custom video trailers to show you exactly what you’re paying for. Planning a trip to New York City soon? 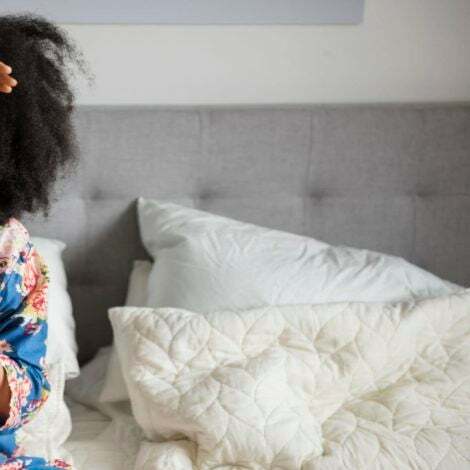 The next time you visit the Big Apple, support these small Black businesses and enjoy one (or more) of these once in a lifetime experiences. Harlem-based host Maxine’s roots in the area date back to the 50s and 60s to the soul food restaurants and grocery store her family owned there. After winning a business competition with Harlem Business Alliance, she founded Bike Harlem. With Maxine as their guide, guests will bike through the bustling streets of the New Harlem Renaissance. “I've curated churches, jazz clubs, historic architecture, and eateries showcasing some of the area's most significant icons,” says Maxine. Culture plus exercise? Sign us up, please! 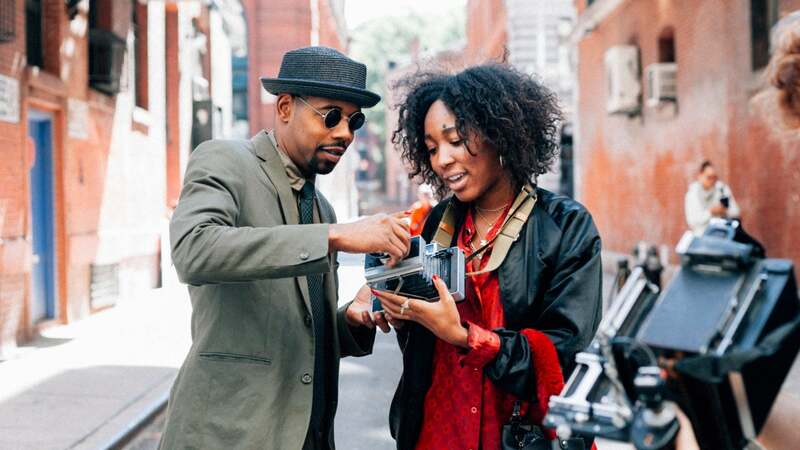 What will Black travelers enjoy most about your experience? Harlem is one of the most beautiful and historical neighborhoods in Manhattan. Some of the greats of the African American diaspora lived, worked and played in the same streets we explore during this experience. 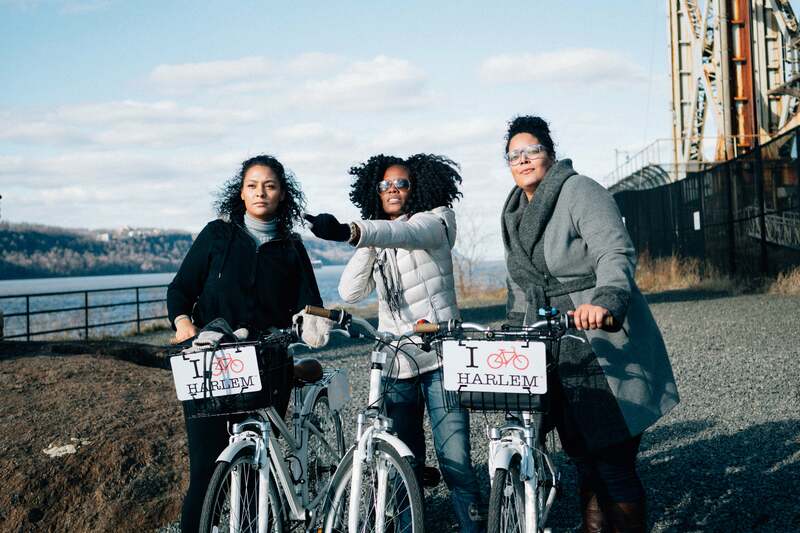 Black travelers will enjoy biking through Harlem with a local while learning about the community’s interesting past and feel firsthand the new Harlem Renaissance currently taking place. How do you feel that it contributes to cultural learning? There is a sense of pride I get living in Harlem. Travelers learn about Harlem from how the community began and became coined “Black Capital of America” to the current gentrification that is happening in Harlem. You can’t talk about American history without talking about African American history in which Harlem played a significant role. Why did you choose to share this experience with travelers? I am so in love with Harlem and it was my goal to share this love. Through solo travel around the world, I gained a passion for taking bike tours. The tours provided an inside look at the history and culture of the places I’ve visited. Through these experiences is where I decided I wanted to share my love for Harlem and that was when I began the brainstorming for I Bike Harlem LLC. 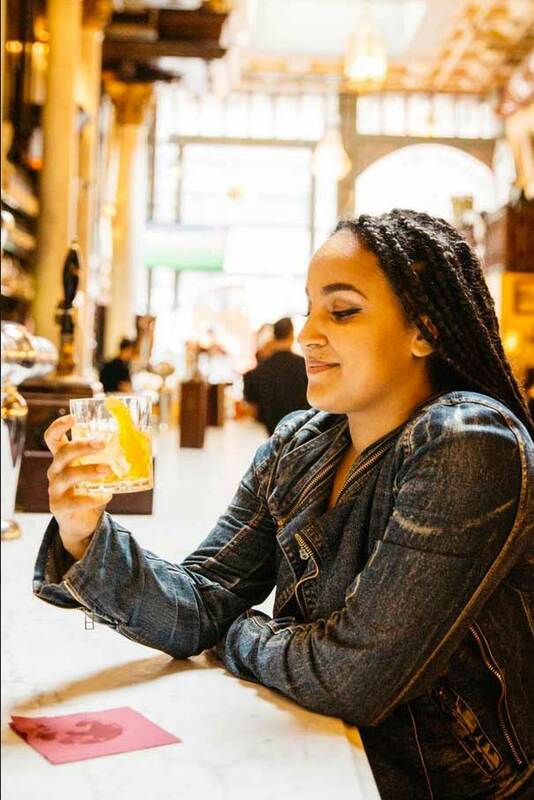 I wanted to provide a fun and active way for travelers to experience my neighborhood while learning about Harlem’s dynamic history, culture and most importantly, experiencing the delicious food. When I curated the tour, it was important for me to support local businesses and landmarks by ensuring the tours make stops at these places. Airbnb Experiences has helped I Bike Harlem reach a broader range of travelers who are interested in exploring the riches of Harlem. What makes it just as perfect for locals as it is for tourists? Locals have the opportunity to learn about the amazing community they live in, with a local tour guide who is very involved in the community. It will help them form a whole new respect for the history and soul of our neighborhood. What’s your best tip for booking this experience? Be sure to book in advance of your travels because the tour tends to fill quickly. 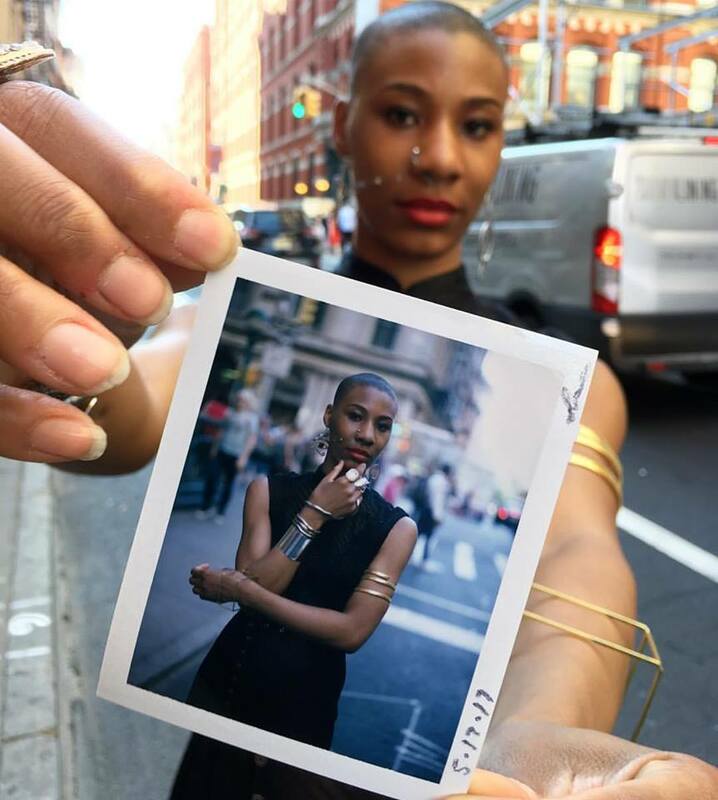 Put your smartphone down and let your inner street photographer come to life with a little help from host Jean Andre, a Harlem native, and analog portrait photographer. After meeting you for coffee, he’ll walk you through the streets of NYC and show you how to take a closer look at the people who walk them (his muses). You’ll learn the basics of operating a fully manual polaroid camera and walk away with your own street style portrait. Celebrities can’t resist this unique opportunity either – Jean Andre’s past guest include Common and Spike Lee. I believe Black travelers will enjoy learning my journey as a young Black professional and also hearing about the story on how I met my mentor Louis Mendes, a pillar in Black photography history with a contribution of 50 years to Polaroid photography. Polaroid photography contributes to cultural learning because it requires genuine interactions and connections between the photographer and subject to get the perfect portrait. Through my tour, I am sharing my personal story as well as teaching my craft to people from all over the world. I feel I have somewhat of a direct influence on their overall perception of New York City, so I like to showcase the hidden old stone blocks that tourists normally would not explore due to lack of access. Why did you choose to share this particular experience with travelers? The amount of positive feedback I have received since getting into shooting Polaroid Photography over eight years ago has motivated me to want to share its beauty with a broader audience especially since it is a rare medium. A lot of my clientele outside of Airbnb are either New Yorkers or transit travelers who appreciate photography and or photographers themselves. I think the appeal lies in the style of the cameras I use. In a fast pace city where technology mostly dominates, it is somewhat refreshing for people to see me in their neighborhoods every day with these old cameras. It’s perfect for locals because they are able to also learn about this lost art form in their own backyard. My best tip for booking this experience would be to just bring your best you, and I'll do the rest. 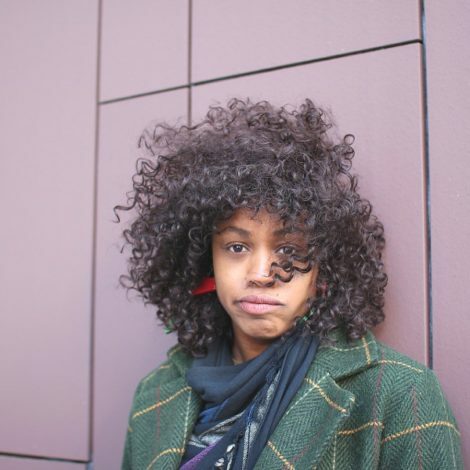 Harlem-based Mikaila, who founded The Common Thread Project, knows her fashion and her culture. The ivy-league educated fashionista has a Ph.D. in anthropology and a passion for educating tourists about the history of Harlem’s fashion scene. Join her for a two-hour deep disco dive into the fashion scene/brands on Harlem’s iconic 125th Street and beyond. Yes, yes, yes! There are many things that make this tour special. For one, unlike most shopping tours, this tour is as much about the culture as it is about the clothing. Harlem is the black mecca of Manhattan, and it has a rich history. Not only will I take you to three or four boutiques featuring truly innovative Black designers, I will weave you an intricate tale of Harlem’s fashion history as we visit important landmarks like the Apollo Theatre and Harriet Tubman’s Memorial statue. In a time where everyone is wearing the same Zara dress, on this tour you are guaranteed to find a unique piece of clothing, with a rich story, made by an exciting new designer. You’ll be supporting your closet, a local black business, and your culture all in one fun day. Everyone wins. Harlem has been using fashion as a form of revolution since the Harlem Renaissance in the 1920’s. I’ll cover everything from how zoot-suits developed out of a resistance to World War II, all the way to today when amazing local Harlem designers like Dapper Dan are finally getting their due from luxury brands like Gucci. On this tour, you’ll get some interesting new cultural knowledge, but it won’t feel like a boring history lesson because you’ll be trying on fabulous pieces along the way. In a time where the fashion industry is consistently failing black designers, I wanted to create an experience that celebrates them. It’s my job as a fashion anthropologist to find the hidden style gems of a local community. That means I’ve done the work to find the BEST boutiques in Harlem. Sadly they don’t always get the exposure that bigger brands do. They’re so overlooked I have introduced Harlem boutiques to people living in Harlem. Even if you are already familiar with a boutique on my list, you’re probably not as familiar with its history, it’s mission, and the ways in which it’s designers are using fashion to make a real change for their families, their community, and New York City as a whole. I’ve interviewed and spent a lot of time with these artists, so even as a local, you’re going to experience their fashion in a whole new way. It makes the shopping more satisfying when you know the story. 1. Do it now. The resurgence of Dapper Dan has put Harlem fashion back on the map. Be part of this movement. Book this tour with friends. The best tours are with groups of people like alumni groups, book clubs, and sorority and fraternity groups. (Yup! I’ve got tons of men on this tour). The more the merrier. Care for a shot of history to go with that cocktail on your next visit to New York City? Licenses tour guide and Airbnb host Rory welcomes guests on a three-hour walking tour through the immigrant progress toward the American Dream during Prohibition. The tour includes one of New York's last-standing 1920s speakeasies and expertly told tales of the period’s most notorious gangsters and infamous bootleggers! What will Black travelers enjoy most about this experience? Hope. The era jettisoned a lot of Blacks to a position of something beyond brunt force labor. They made money and lots of it. This was a time period where Black, Hispanic, female, Chinese, rich, poor, family or no, all came together under one roof to thrive. Because everyone was doing something illegal and opportunities were abundant. As a guide, I have a focus on immigration. Typically in the tourism world, that means “Ellis Island tours,” but that’s just the tip of the iceberg. Every neighborhood is founded by a group of escaping or freed slaves. The evolution of the city is fantastic. And so we spend a lot of time on this tour touching on the Irish, blacks, and Germans. The relationship of these groups has changed significantly today and so we learn why and how and the dynamics of social constructs and oppression. Many are unaware of the origins of the word jazz and its influence during prohibition. Prohibition was such a pivotal part of the history of New York that it’s almost impossible to be in a neighborhood and not touch on some aspects of the era. For tourists, the drinking spots you will visit are crucial not only to the prohibition history but the authentic New York experience. For the New Yorker, you will be surprised at the destinations we venture into within the middle of Manhattan. Many New Yorkers have never been to all three spots. We will walk through the hustle and bustle of New York and then venture underground to some of the most fabulous hidden gems New York has to offer. Book fast! Weekends sell out several weeks in advance. If you don’t see availability for the dates and times you’re interested in, message me via Airbnb and I’ll put you on the waiting list. Our hats are off to this unique must-try experience. Host Brandon has been crafting hats for nearly a decade and he’s super passionate about keeping the craft alive. 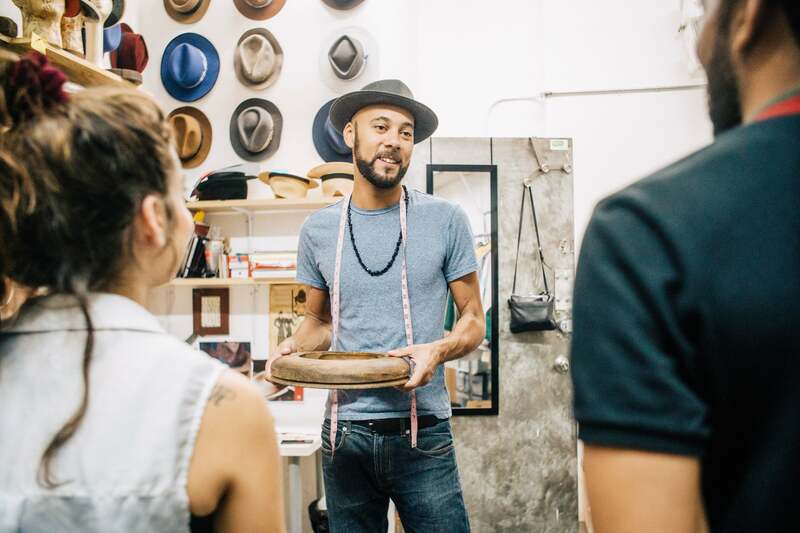 Brandon, the founder and head designer of B.M Franklin & Co., takes guests on a 2-hour adventure into the world of hat making. First, you’ll visit the Garment district to explore the materials and their history, then you’ll have a chance to meet the men and women who work diligently together as an intimate community to keep the art alive. I think most will enjoy the hands-on, interactive aspect of it. One part of the experience involves the group being in my shop and learning about the history of the craft, our business and where it’s going. They're surrounded by not only product samples but also the tools that made them. We walk through the process of making a hat, and while this is happening, certain steps and techniques are executed by the guest. I believe this is important because the art of the hand-made has been making a strong resurgence and within our community, we need to be a part of this movement. 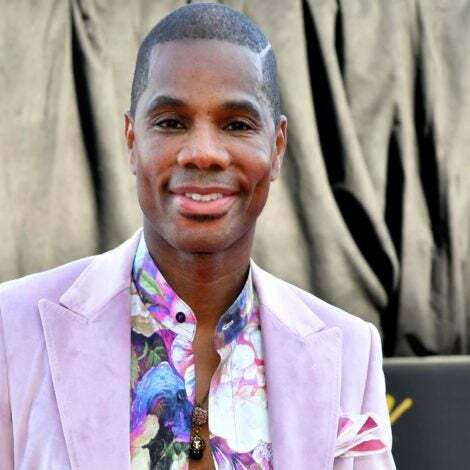 There has been recent talk about there not being enough Black fashion designers or any at all that is on the level of any leading fashion house or designer. I believe not only does this need to change but it needs to be taken a step further meaning designers can be craftsmen/women as well, not just creative directors. In helping to create a sense of opportunity awareness in our community. I feel its important and educational to see through this experience that creating an opportunity for yourself is possible, it’s not easy, but it’s possible. Once that’s done here’s how we share it and teach others so that we continue to build up our African-American community as a whole and our community within the fashion and fashion-craft industry. Because not only is it educational, but it builds awareness for the brand and the craft. If the craft doesn't get any awareness or exposure, then not only am I out of a job but so is every other craftsman. New York is such a big city and you never know what’s happening behind the door or in then building next to you. Instead of going to brunch or doing the standard Saturday walk (because you're hungover from Friday), you book an experience and you are now feeding your mind, body and creative soul with inspiration and education. It also raises awareness amongst locals. My best tip (aside from just book the experience trust me its fun!) is come with an open mind and creative spirit. No fashionista visiting New York City can resist the hunt for a good vintage find. Host Angela, a personal stylist and founder of Style Closet Life, a sustainable styling service, is your go-to girl for all things vintage shopping in NYC. Allow her to take you on a two-hour tour of some of the most sought-after vintage shops in the city and listen up while she shares her stylist secrets on how to find vintage looks that fit your body and your style. 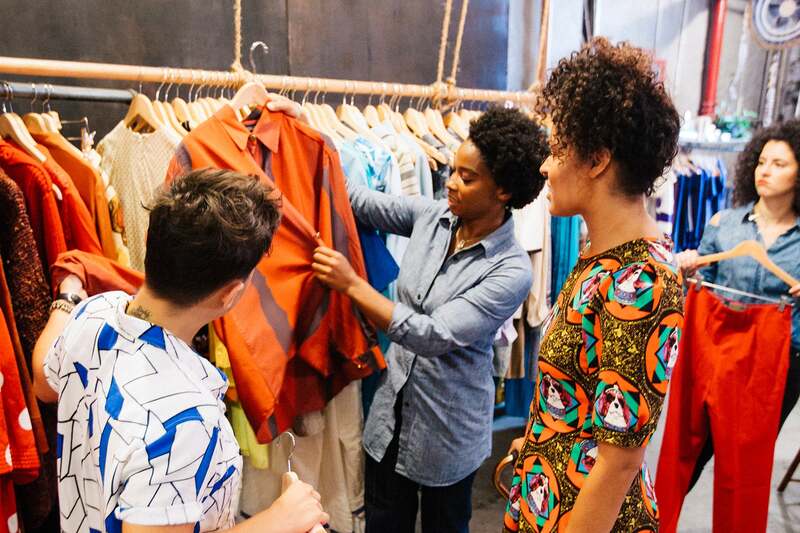 The process of vintage shopping is a unique experience within itself. Between the dig, the scour and discovery, it serves as a way of unearthing one's form of personal expression. Most travelers find the tour entertaining and are thankful to have a stylist on hand while shopping. My groups are always made up of people from all over the world. It’s a casual way to meet others and learn about their cultures while visiting the small shops that have grown within the community. As we walk from shop to shop, I share some local history and interesting facts about the neighborhood. I wanted to show that vintage is not just dusty thrift stores. Cool vintage pieces can be found in boutique style shops that have a particular point of view, style, and impressive selection. 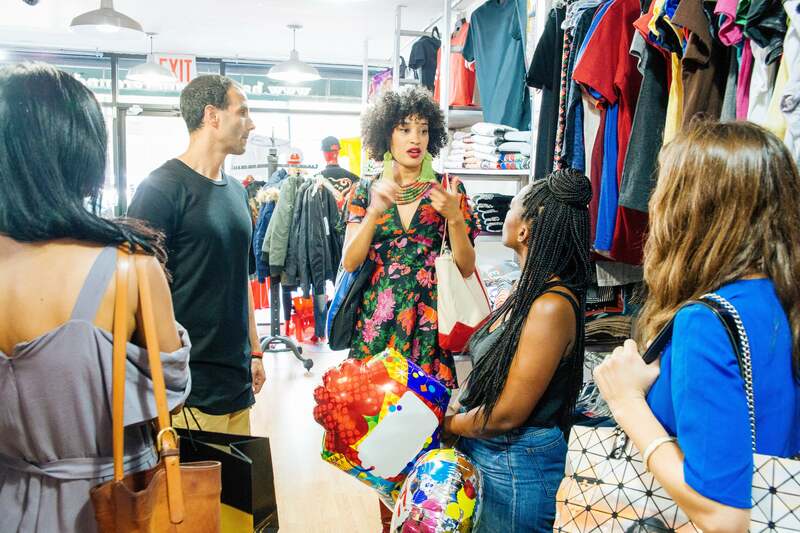 New Yorkers love to know about untapped shops to keep their style fresh. This tour shows them new places to get their clothes. Another bonus: When you mix vintage into your wardrobe, you won’t see your exact outfit walking down the street. Come with an open mind and willingness to try things on that you normally would leave on the rack. You never know until you put it on your body. That’s how most of my guests discover their new favorite piece!